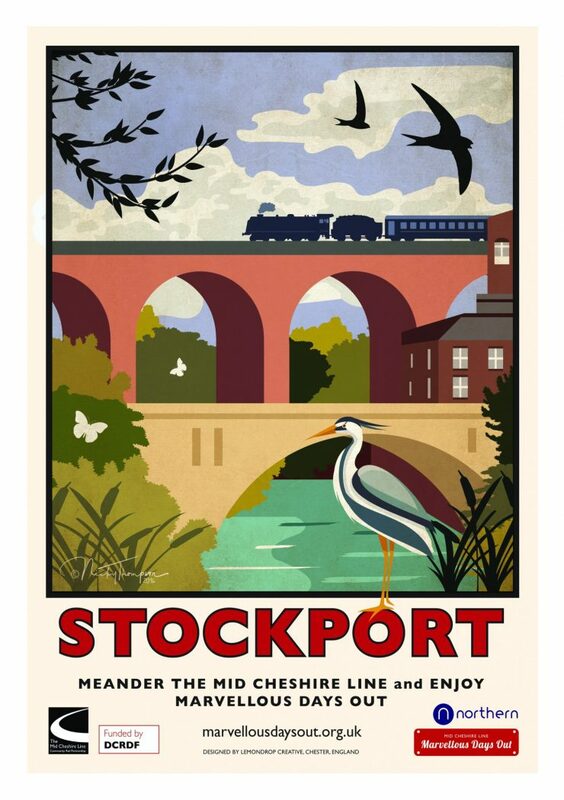 “We welcome all to the Metropolitan Borough of Stockport which has a great story to tell. A great place to start is our museums and then perhaps Afternoon Tea at The Plaza”. Stockport used to have two railway stations – Stockport Tiviot Dale and Stockport Edgeley. In January 1967, Tiviot Dale closed and was demolished the following year. Stockport Edgeley then became the principal station for Stockport and that is why some locals still refer to today’s Stockport Station as “Edgeley”. If you are travelling into Piccadilly for a trip on the Mid Cheshire Line, you can also join the Line here. Our Mid Cheshire Line trains depart from Platform 2 where you can also pick up a sandwich and drink. Stopping off in Stockport for the day can be an experience in itself and, if you enjoy good hospitality, there are two hidden gems you must visit. Our first gem is the restored Plaza Super Cinema and Variety Theatre in Mersey Square. Here you can take yourself back to the 1930s, when our iconic posters were common place on Edgeley Station. It was also a world of style, elegance, relaxation and indulgence. This is what The Plaza offers today. As well as classic films, music and theatre, The Plaza has a lavish Art Deco Café which is open Monday to Saturday, 10am to 4pm. Whether it is the Famous Plaza Bacon Butty or the Plaza Afternoon Tea with strawberry preserve and Devonshire clotted cream, your visit is bound to be memorable and delightful. Our other hidden gem is one of the few attractions on the Mid Cheshire Line restricted to the over 18s. It is the Robinsons Brewery Experience, which you must book before your visit. Search “Robinsons Brewery Tour” for more details. On this tour, you will not only learn about Robinsons’ award-winning brewery process and taste some beer but also, if they are on site, meet their renowned shire horses – who have served the Brewery for over 100 years. Their restaurant, with its Brunch Menu, is excellent value for money and perhaps some Old Tom bottled beer to take home to remind you of your visit?